We Have a New Mega Millions Winner! Somewhere out there in Pennsylvania, someone has just been asked by a coworker or friend how their night was, and that person will have to act super cool like nothing out of the ordinary happened. But that person had the best night ever, because one lucky ticket holder in Pennsylvania won the $152 million (AUD$205 million) Mega Millions jackpot last night! Three millionaires came out of last night’s Mega Millions draw after the winning numbers — 20, 30, 62, 65, 74 and Mega Ball 1 — were announced. Besides the super lucky winner in Pennsylvania, two tickets, sold in New York and Texas, matched the five main numbers for the second tier prize of $1 million. There were actually 1,810,203 winners in total: 1 jackpot winner, 2 $1 million winners, and 1,810,200 other secondary prize division winners! 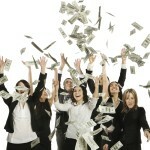 Mega Millions is a game for people who like to win! All of us already knew that, but a solid reconfirmation every now and then is more than welcome! Want to be the next big Mega Millions winner? Since the jackpot was won, it drops back to the $15 million (AUD$20 million) starting value — but isn’t that still more money than you could ever imagine? Go for it! And make sure to check all the prize options when the winning numbers are read — don’t just throw out your lottery ticket in annoyance if you don’t match every winning number, because there are millions of secondary winners out there that took great prizes home! Just click on the Play Now button on this site to get your tickets for next Friday’s draw in America’s (and maybe Australia’s too) favorite lottery!